"Lose yourself in the dazzling world of Yayoi Kusama—rebel, icon, and worldwide phenomenon." Yayoi Kusama is an 87 year-old Japanese artist known for creating hallucinatory paintings & walk-in installations of physical representations of the idea of infinity using bright colors, lights, loops, pumpkins, and polka dots. 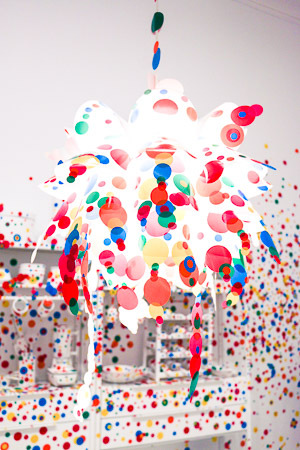 In 2014, Kusama was crowned "the world’s most popular artist" as ranked by museum attendance. Having only been open to the public for less than two weeks, her D.C. debut of #InfiniteKusama at the Hirshhorn Museum and Sculpture Garden is now the hardest ticket to get your hands on. Yayoi Kusama has been living in a mental institution in Tokyo for the past 40 years. She voluntarily checked herself into the asylum in 1977 for psychiatric health problems such as depression, OCD, panic attacks, and hallucinations. The only time the artist leaves is to work on her art at a studio she owns across the street from the institution. Kusama writes novels in her room at the hospital every night. Lucky for you (super-awesome person that's reading this) SEV CITIES got insider tips on how you can still get the chance to take a glance at Kusama's totally trippy/magical exhibit. First things first... The exhibit is free but all visitors will need to acquire a free timed pass in order to get in, including children. Option 1 (best bet): Try to get a same-day walk-up pass. A limited number of daily walk-up passes are offered each day, including week days and weekends. A line for same-day passes will start forming around 9:00 AM on the Museum Plaza (right by the fountain) and the timed passes will be distributed starting at 10:00 AM on a first-come, first-served basis. A new batch of timed passes are released online and in person every Monday at noon the week prior. However, due to the popularity of the exhibit, the museums website has crashed every time the new passes become available online. Your best bet is going in person that Monday morning to try and get timed tickets for the following week. All advance Timed Passes have been claimed for Feb 23-March 13 already. A limited number of same-day walk-up timed passes will still be available at the museum daily. The line for same-day passes will start forming around 8:30 - 9:00 AM each day. Passes for those waiting in line are distributed at 10:00 AM. According to Hirshorn, the museum will be introducing extended hours + more walk-ups in the following weeks. Starting Wednesday, March 22, Every Wednesday through May 3, the gallery will stay open until 8:00 p.m., with final timed-pass entry at 6:30 p.m. 1.) Don't go on the weekend. 2.) Wednesdays and Thursdays are the best days to visit the exhibit/ try and get a timed-pass. 3.) It'll be much easier to obtain passes at the end of March. 4.) Don't try to get a pass online. In person! In person! In person!